Instead of snow, there’s something else falling from the sky - - Bubbles! Zoe, a California sea lion, and Kitovi (Kit), one of our young Northern Fur seals, are enjoying a Bubbly Wonderland! You can see that Zoe prefers to catch the bubbles in her mouth and Kit who is just a few weeks old in this video just gazes at the bubbles falling from the sky. 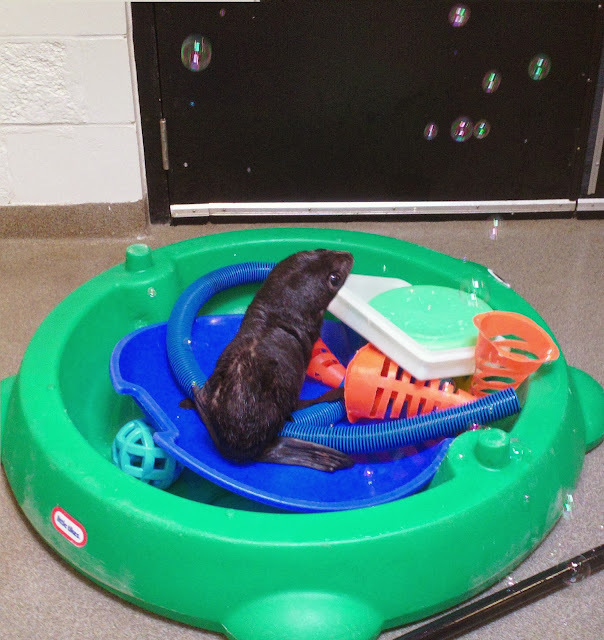 Bubbles are just one of the many ways that we engage our seals and sea lions in enrichment.Check out some of the many ways we interact with our seals and sea lions through play from rain drops, jello, light reflections, ice toys . . . . the list is endless! Be safe and have happy holidays everyone!! Look who's borrowing the kiddie pool!